The Barbarians will take on the New Zealand All Blacks at Twickenham Stadium on Saturday 4th November in celebration of the NZRU's 125th anniversary. The winner will be awarded the Killik Cup. The match will renew one of rugby's most historic rivalries. It was during the sides' 1973 contest that Gareth Edwards famously scored that try, helping the Barbarians to a 23-11 victory at Cardiff Arms Park. The Baa-Baas and the All Blacks have played each other on a total of 10 occasions since their first meeting in 1954. 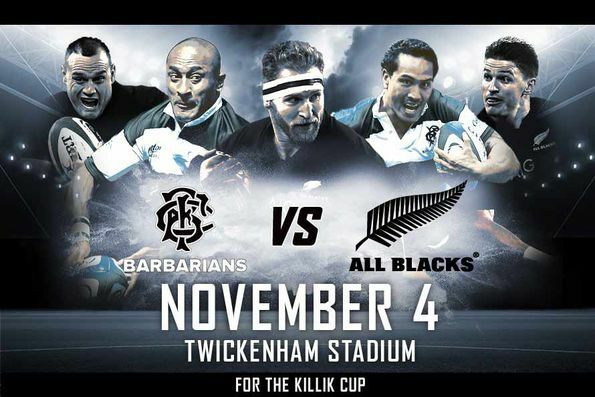 New Zealand have won seven of those matches, whilst the Barbarians have won two matches. There was also one draw between the two sides in 1974. Barbarians V New Zealand is not available to book, please sign up to our newsletter for updates and offers on forthcoming and available shows. Where is Barbarians V New Zealand?